I love stocks. But Rob Bennett has eschewed them for some time now. Why? First, let me introduce Rob. He is a passionate investor who loves a good investment debate. Rob Bennett has also developed the first retirement calculator that contains an adjustment for the valuation level that applies on the day the retirement begins. His bio is here. Now Rob has been out of the stock market for quite sometime now. Well, let’s see why he’s decided to take this approach and how he’s done so far. I went to a zero stock allocation in the Summer of 1996. I’ve stayed at zero stocks for the 15 years since. Am I insane? Don’t I know that stocks are always best for the long run? Don’t I understand that investors need to be willing to take on risk so that they can expect to accumulate the assets needed to finance a middle-class retirement? I don’t think I’m entirely insane. For one thing, I’m ahead. Zero Stocks for 15 Years And Doing Fine! My money is in Treasury Inflation-Protected Securities (TIPS) and IBonds paying an average return of 3.5 percent real. That’s a bigger return than stocks have been paying for those 15 years. The compounding returns phenomenon will cause my edge to grow larger and larger over the years. And I’ve obtained the higher return while taking on dramatically less risk than I would have taken on by investing in stocks. So who’s nuts? Could it be that the experts who tell us that we must always be heavily invested in stocks are actually the crazy ones? Well, I wouldn’t actually say that the experts are crazy. I would say that they are confused. There’s been a lot of exciting academic research published in the past 30 years showing that the conventional understanding of how stock investing works (the Buy-and-Hold Model) gets it mostly wrong. 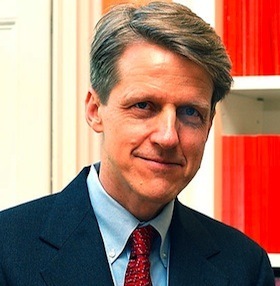 The new model (Valuation-Informed Indexing) is rooted in the research of Yale Economics Professor Robert Shiller rather than in the research of University of Chicago Economics Professor Eugene Fama. I think it makes a lot more sense. 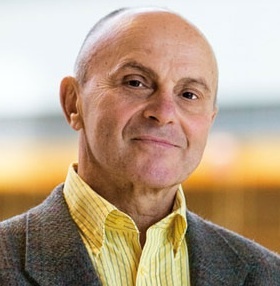 Let’s review Eugene Fama’s buy and hold investment model (aka efficient market theory) vs Robert Shiller’s valuation informed indexing model. Which professor’s investment model do you follow? The old model presumes that stocks are always priced properly. If this is so, price changes are caused by unforeseeable economic developments. Thus, timing the market can never work. The only way the investor can tap into the strong returns of stocks is to invest in them at all times. There’s only one problem with this theory. It does not describe how stocks have worked for the 140 years for which we have data available to examine. Wade Pfau, Associate Professor of Economics at the Graduate Institute for Policy Studies in Tokyo, Japan, recently compared how the two models performed for every 30-year time period in the historical record. He found that Valuation-Informed Indexing beat Buy-and-Hold in 102 of the 110 time-periods. Investors who increased their stock allocations when prices were good and lowered their stock allocations when prices were dangerously high earned higher returns at dramatically less risk. Investor heaven! But wait. That sounds like stock market timing. Timing doesn’t work! Everyone knows that. Right? Um — Actually, that’s not right. There are lots of experts who say that timing doesn’t work. The reality, though, is that there has never been a single study showing that timing doesn’t work. The confusion stems from the fact that there have been many studies showing that one form of timing (short-term timing) doesn’t work. Change your stock allocation with the expectation of seeing stronger performance within a year or two and the odds are great that you are going to end up losing. But that’s not the only way to practice market timing. What if you were to take stock price into consideration when setting your stock allocation with the understanding that it might take as long as 10 years to see a payoff for doing so? In that case, you would be almost certain to see the payoff. Long-term timing always works. At least it always has (in the past). It’s not hard to understand why. The U.S. economy has been sufficiently productive to support an average annual stock return of a little more than 6 percent real for as far back as we have records. If you pay fair price for the purchase of an index mutual fund, it’s reasonable to expect a long-term return of something in the neighborhood of 6 percent real. But what if you pay two times the fair price of the stocks you buy? In that case, you would be paying $200 for every $100 of stocks paying 6 percent real. Your return would likely be something near 3 percent real. If you buy stocks when they were priced at three times fair value (as they were in 2000), you should reasonably expect a long-term return of something in the neighborhood of 2 percent real (you’d be paying $300 for each $6 of annual return). That’s how things work, according to the academic research of the past 30 years. Stocks are like everything else put up for sale in this consumer wonderland of ours. Buy them at a good price and you’ll obtain an amazing value proposition. Buy them at a fair price and you’ll do fine. Buy them at an insanely inflated price (like the prices that have applied since 1996) and it’s unlikely that you’ll do better than those invested in super-safe asset classes. The strategic implications are profound. We have learned how to greatly diminish the risks of stock investing. The risks of stock investing are heavily concentrated in those time-periods when prices are high. Never yet in U.S. history has there been a time when stocks performed poorly starting from a time of low or moderate prices. And never yet in U.S. history has there been a time when stocks performed well starting from a time of high prices. Open yourself to the idea of changing your stock allocation in response to big price swings and you will earn far higher returns at dramatically diminished risk. It turns out that market timing (at least the long-term variety) isn’t such a bad idea after all! This is just an example of what you can do. I based it on this portfolio conceived by Jeffrey Kosnett, one of Kiplinger.com’s Senior Editors. It’s actually done well for 2009 (the performance data was calculated here), earning 23% in its totality, while U.S. stocks gained 26.46% in that year. However, moving forward, allocations may need to be reevaluated as prices have shifted dramatically for some of these asset classes. I’d be rebalancing any portfolio that has shifted heavily due to large price swings. Your personal psychological makeup – are you naturally risk averse or a nervous nellie? For instance, given the low inflation environment we’ve come to enjoy for a while now (and yes, we’re spoiled), it seems easy to forget about the threat of inflation eroding our assets. Consequently, this may allow us to be more comfortable about tilting towards a cash heavy portfolio. But who knows how long this environment can last? Shouldn’t we hedge appropriately anyway? So how about you: what do you think of the “no stock portfolio”? Would you opt for one (or not)? This is an intriguing portfolio. Have you ever given thought to international diversification, to hedge against the falling dollar? That’s a smart question, Hunter. I think you have identified a weak spot. Yes, I have been concerned about the falling dollar going back to the first day. It wasn’t in the process of falling back then, of course. But the fall was not unexpected by those of us who believe that stock valuations matter. It may be that I was wrong not to protect myself against this. I ultimately elected to take a somewhat philosophical approach. I believe that the strength of the dollar reflects the strength of our nation. If the dollar fails totally, we are going to fail totally as a society. I don’t think that is going to happen. If I did think it was going to happen, I should probably take more extreme measures — perhaps move elsewhere before the stuff hits the fan. I refuse to go down that path mentally because I just see too much negativity attached to it. I am not giving you an intellectual defense of my decision. It’s more of an emotional one. I think emotions matter. I am not giving up on my country (or on the dollar). I think the dollar will go down. I think we will see bad times. But I think we will recover as a society and I think the dollar will recover with us. When that happens, I hope to be there enjoying good times along with all of my friends and neighbors and co-workers just as I earlier endured the bad times along with all of my friends and neighbors and co-workers. I chose (perhaps wrongly) not to involve myself in guessing as to when the dollar is going to fall and what is the proper hedge and all this sort of thing. I elected to keep it simple. The dollar will go down and the dollar will go up and I will be there on both sides of the hill. I think what I am saying is that it would feel to me to be a bit of a betrayal of the United States for me to abandon the dollar. It just doesn’t feel right to me. I offer no criticism of others who do otherwise. And I understand that some would say that I abandoned the United States when I moved out of stocks for a time. I don’t see it that way. I feel that I am helping us by investing pursuant to what I believe to be the stock investing model of the future, one that all of us will be embracing in days to come. But there’s something about abandoning the currency of my country of birth or even betting against it that makes it a step more than I am able to travel. I’m not saying that this mix of decisions is 100 percent logical. I do not claim to be a 100 percent logical person. I love my country and this seems to me to be the best way to evidence that love in my investing decisions. TIPS have done well historically but prospective returns depend on current valuation too. Real yields are negative for 5 year TIPS and barely 1% for 10yr TIPS; skinny. As for the modified no-stock portflio, there is much equity-like risk in REITS, junk, commodities and even munis today. Too many “stocks in drag” for me. Interesting approach that makes you stop & think. Thanks! Real yields are negative for 5 year TIPS and barely 1% for 10yr TIPS; skinny. Thanks for being willing to take a look at an idea that many still view as being a bit “out there,” Ricky. I don’t want people to get the idea that I am a TIPS advocate. I am a stocks advocate! The reason I went to TIPs when stock prices went so high is that owning TIPS for a time permits me to own more stocks in the long run. You are of course correct that TIPS do not offer nearly so good a deal today as they once did. My take is that that’s a good sign for the future. TIPS returns have gone down because lots of people have become scared of stocks and moved to things like TIPS. The government doesn’t need to offer such a high rate to get people to buy its TIPS anymore. Once stock prices start coming down, they don’t come down just a little bit. They continue coming down until they are at one-half of fair value (that’s a 65 percent price drop from where we are today). Do you know what the most likely 10-year annualized return is on stocks purchased at those prices? 15 percent real! We are probably about five years away from the best time to invest in stocks in U.S. history. All you have to do is hold on to some of your money so that you will be able to participate. Taking this reality into account, TIPS offer an attractive deal today. The direct return is not good. But TIPS don’t only offer a direct return. They also permit you a means to hold into your money long enough to be able to participate in those 10-year annualized returns of 15 percent real. Factor that in and I think TIPS look pretty good even when providing a return of 1 percent or 0 percent. My focus is always on stocks. When I can get a good return from stocks, I of course want to be in stocks. When I cannot get a good return from stocks, I want to be in something that will permit me to earn a good return from stocks the next time stocks are offering a good return. All signs are that we are today within five years of seeing that happening. That’s the theory behind this approach, in any event. I am grateful to you for giving it a listen. Please take care. Any chance you could explain more why you think we are “probably about five years away from the best time to invest in stocks in U.S. history”? Please click on the Excel file link. That page lists the P/E10 values we have seen for every year in the historical record going back to 1870. Scroll to the first time you see a P/E10 value of 24 (that’s scary high). Then look at what happens 10 to 15 years later. We go to a scary low P/E10 level of 7 or 8. It’s the same the next time we go to 24. And the next. We are now living in the wake of the fourth time we have gone to 24. It’s not an accident that going to 24 always causes us in the years following to go to 7. When we are at 24, we are all pretending that we possess far more wealth than we really possess. For example, in 2000 we were counting $12 trillion in pretend wealth as money we could use to finance our retirements. We cannot remain at such high P/E10 values indefinitely. The purpose of a market is to set prices properly. So we always fall to fair value. But we don’t fall only to fair value. The drop to fair value means that we all lose trillions in pretend wealth. When people lose most of their life savings, it scares them. When people get scared, they spend less. This causes thousands of businesses to fail. The business failures cause millions to lose their jobs. A P/E10 value of 24 always leads to an economic crisis. There is not one exception in the historical record. If stock prices behave in the future anything at all as they always have in the past, we will within a few years be crashing to a P/E10 level of 7. That’s a 65 percent price drop from where we are today. That’s the bad news. The good news is that, once we get to 7 (one-half of fair value), there is only one direction in which stock prices can go — up and up hard. If you do a regression analysis of the historical data to identify the most likely 10-year annualized return starting from a P/E10 level of 7, the number that comes up is “15 percent real.” It could be that the return will be a lot higher than that. There’s a 50 percent chance that it will be that high or higher. The last time we have seen such prices was 1982. In contrast, the most likely annualized return in 2000 was a negative 1 percent real. It is true that on average stocks are a high-return asset class and a high-risk asset class. The mistake in the conventional thinking is the idea that stocks are always a high-return asset class and always a high-risk asset class. The reality is that all the risk is concentrated in time-periods when prices are sky-high (as they have been since 1996) and most of the return is concentrated in time-periods when prices are insanely low (which is where they always end up after the multiple crashes inevitably brought on by times of high prices take place). We are one stock crash away from having stocks available for purchase at amazingly good prices. My no-stock portfolio is 100% cash. I’ve considered only two other alternatives, peer-to-peer lending and property. My rationale is that the markets are fundamentally wrong, so it doesn’t matter very much to me that they’re an effective means of investment under the right circumstances. I think I would find it really refreshing to see something resembling ethics and even morality emerge now and then in discussions regarding investment. If a system is broken and hopelessly gamed, my assumptions and probably not those of the majority, at no point is it appropriate to give it consideration. I think I would find it really refreshing to see something resembling ethics and even morality emerge now and then in discussions regarding investment. Humans are by nature both ethical and non-ethical. There is a tension that we always see between our desire to know reality and our desire to cut corners. Things have gotten wildly out of balance in the investing realm. It’s not just that lots of us have been taken in by Get Rich Quick schemes. Get Rich Quick has become the dominant model, the conventional thinking, the only permitted thinking in many places. This is both weird and dangerous. My take is that extreme moves in one direction bring on extreme moves in the other direction. It’s a mistake to let the negativity take you down. We’re going through a bad time right now. Good people will in time come to think it through and see where we went off the track. Then we will all understand better what we need to do in the future to remain on the right track. Things will become as good in the future as they have become bad in recent years. We are headed to a very exciting place where we are all going to live richer and more fulfilled and more honest and more loving lives. Or so I tell myself to keep my spirits up during the dark times, in any event. Can you please lay out the various dates and amounts that you purchased your own TIPs bundles, and how you managed to continue to achieve an average on your TIPS returns of 3.5% after inflation? Is it a ladder? What are your maturities? Do you buy on the open market or from the Treasury Direct site? What are you most recent yields? Are you spending from the principle off the first TIPS you had to cash in at maturity already? Basically I am wildly curious for any and all of the specifics on your personal approach, so that those who follow your recommendations can reconstruct how it worked, and then extrapolate how it might work for them. I guess that’s a “No”. Welcome to The Digerati Life! I’ll get in touch with Rob about your questions. He may be busy right now but I’ll let him know you had a question about TIPs. Hopefully he’ll be able to provide you some helpful info. Thanks for stopping by. This topic is something I’m interested in as well because I have some TIPs but wondering about buying more. $1,000 invested in Vanguard’s Balance Index Fund (VBINX) on 1/1/1996 grew to $2,742 by year end 2010. $1,000 invested in Vanguard’s Wellington Fund (VWELX) on 1/1/1996 grew to $3,115 by year end 2010. $1,000 invested in Bill Schultheis’ Coffeehouse Portfolio on 1/1/1996 grew to $3,135 by year end 2010. In fact, it appears that despite “scary” PE10 ratios in 1996 many folks have done quite well employing strategies other than timing the S&P 500 Index. This may come as a surprise to you, but many people actually think it wise to diversify across a wide variety of assett classes other than soley in the S&P 500. If you or other readers of “The Digerati Life” are interested, I’d suggest you Google “Simba’s backtesting spreadsheets” where you’ll find backtested results for several such diversified buy-hold-rebalance portfolios dating from 1985. I think you’ll find there are several successful strategies available to the investor other than timing the S&P 500 Index. Correction: $1,000 invested in Vanguard Wellington grew to $3,378 by end-of-year 2010. Did you consider buying stocks when the market was at it’s low after the 2008 crash? From Prof. Shiller’s chart it looks as though the PE10 got down to about 14 then. I guess that is still a “no”…. Can you please lay out the various dates and amounts that you purchased your own TIPs bundles, and how you managed to continue to achieve an average on your TIPS returns of 3.5% after inflation? I just bought them when they were paying that rate, TIPS newcomer. Both TIPS and IBonds were paying 4 percent real at the top of the bull. I wish that I had bought at 4 percent, but I let the conventional advice influence my thinking for too long. I obtained an average return of 3.5 percent real. I tried to tell people about the wonderful opportunity at a discussion board that I was posting at at the time. Do you know what reaction I got from a good number of Buy-and-Holders? Hostility. It was the same with a good number of others who at the time warned about the dangerous of buying dangerously overpriced stocks. The biggest risk of investing is that you will become emotionally invested in your choices. I believe that the future of investing advice is helping people cope with these emotional aspects of the stock investing project. That’s a super-smart question, Ed. Yes, the P/E10 level actually went all the way down to 12 for a short amount of time. Stocks offered a very strong long-term value proposition for about three months. I did not personally buy stocks. While I think those who did will end up with a good 10-year return, I also think they will be put through some very upsetting downturns before they see it. I elected not to take on those downturns. My personal preference is to wait for the next crash before moving heavily into stocks. But I did report on all the podcasts that I recorded at the time that stocks offered a strong long-term value proposition and I persuaded a friend of mine to buy in. He made a big profit and is very happy with me. He sold so as to avoid the effect of the next crash. That worked fine for him. But I am not personally too interested in making too many short-term transactions. I am more the patient type of investor. I believe in Bogle’s idea of keeping focused on the long-term and tuning out the short-term noise. it appears that despite “scary” PE10 ratios in 1996 many folks have done quite well employing strategies other than timing the S&P 500 Index. Some did, Carlyle. But they are very much the exception to the general rule. You are engaging in something called “Backtesting.” This is one of the oldest tricks in investing analysis (I do not say that you are necessarily aware that you are engaging in this trickery — many investors fool themselves far more than they fool any others). To backtest is to look backwards and note that a strategy would have worked if only it had been carried out in some special way that no one knew to follow at the time the decisions had to be made. If you go on discussion boards, you will see stock investors engaging in backtesting rationalizing all the time. You will hear people say “oh, the total stock market index is the only thing you need to invest in — that always works well in the long run.” Then the total index will give horrible results for five years and they will say “Oh, the global index is all anyone ever needs to invest in,” Then that will do horrible for five years and they will say “Oh, the Wellington fund is the only thing that anyone needs to invest in.” And then that will do horrible for five years and they will return to pushing the total stock index, which has been doing well for the entire time since they took all their money out of it. For an investing strategy to work, it needs to be one that can be applied on a going-forward basis. Investing in a broad index fund when it is selling at a reasonable price has never once in 140 years provided anything less than super long-term results, Carlyle. The reason is that, when you are investing in a broad fund at a reasonable price, you are really just obtaining a slice of the productivity of the U.S. economy. So long as the U.S. economy does not collapse, you are sure to do well. The Valuation-Informed Indexer has the odds on his side in a way that those who backtest never can, in my assessment. That said, I hope you were one of the lucky ones, Carlyle, and I hope that whatever strategies you follow in the future work out well for you! Thanks for stopping by. You have my best wishes. This topic is something I’m interested in as well because I have some TIPs but wondering about buying more. I’ve had several people recently tell me versions of the basic story being told with the comment you are making here, SVB. People are nervous about stocks (they wouldn’t be so nervous if it hadn’t been for the earlier crash — that is in the back of people’s minds) and looking for an alternative. But they don’t see alternatives that pay high enough returns. So they are not sure how to proceed. I think TIPS are a good choice today. So are IBonds. So are CDs. But they are not good choices because of the returns they offer directly. It is hard to communicate to people that they need to change their mindset about investing to appreciate how good an options TIPS and IBonds and CDs offer today. The thing that trips people up is that the Buy-and-Hold mindset encourages us to think that stock returns are not predictable. If stock returns are determined by unforeseen economic developments (this is what Buy-and-Holders believe), then they are unpredictable. If stock returns are unpredictable, it is almost certainly better to be in stocks that pay an average return of 6.5 percent real than it is to be in asset classes paying a return of 1 or 2 percent real. I am not a Buy-and-Holder. But I do acknowledge that Buy-and-Hold logically follows from its premise (that returns are determined by unforeseen economic developments). The key to making the switch to the new model is understanding how everything changes once you accept the premise of the Valuation-Informed Indexing model — that stock returns are determined not by unforeseen economic developments but by investor emotion in the short term and in the long run by the overall economic reality that stock returns must reflect the economic productivity we generate, which permits a long-term return of 6.5 percent real. If that’s so, stock returns are highly predictable. All that you need to do is to look at where stocks would be if they had been earning 6.5 percent real each year, where they are now instead, and what is going to happen as prices change to reflect the overall economic reality. What you get when you do the analysis is that stock prices are going to fall by roughly 65 percent over the next few years (as investors realize that this fourth try of the Buy-and-Hold approach is going to work out no better than the earlier three) and then be priced to provide amazing returns for the following 10 years. If that’s so, the 1 or 2 percent returns available today from the super-safe asset classes look fantastic. You not only get to avoid the huge losses that Buy-and-Holders will be seeing in the next crash. You also get to participate in those huge returns that will follow for 10 years after the next crash. The Buy-and-Holders won’t have the assets or courage to participate in those gains. The trouble here is that, when you switch models, you are switching to an entirely different way of thinking about how stock investing works. Buy-and-Hold is all logic. The logic is strong. Buy-and-Hold makes sense. It seems like it should work. And for 10 or 15 or 20 years, it really can work. That pulls people in. Valuation-Informed Indexing is NOT logical. It aims to describe reality AS IT EXISTS, not to force it into compliance with a logical construct. Valuation-Informed Indexers accept that stocks are bought by humans and that humans are emotional creatures and that there are strategic considerations that follow from that. There is no good logical reason why we should have a 65 percent loss over the next few years. There is a strong emotional reason, but no logical reason. And there is no good logical reason why we will see 10 years of 15 percent returns after the crash. Again, we will see that because that is what the human emotions that apply here demand. Those who have a hard time accepting that the driving factor in the setting of stock prices is emotion rather than logic need to look to the historical data. Stocks have never operated according to the patterns that should apply if it were logic setting prices. Stocks have always operated according to the patterns we should expect if it is emotions setting prices. So I have concluded that it is human emotion that is the driver here. The great irony is that the only way stock investing could ever become logical is if we permitted open discussion of the emotional factors. Investors fear this emotions stuff. They don’t like to think that their retirement money is at risk to something as unserious as emotions. So we all want to make stock investing less emotional. The question is — How do we do this? The Buy-and-Hold approach was to ignore emotion entirely in all investing analyses. The idea here is that, if we pretend that emotion doesn’t exist, it will go away. I declare this project a failure. I have seen more emotion in my nine years of investing discussions on the internet than I have seen in discussions of any other subject. Investing discussions are more emotional than discussions of abortion! It”s just amazing. The Valuation-Informed Indexing approach is to incorporate emotional considerations into the analysis being done. Both overvaluation and undervaluation are the product of emotion. So, when we include those factors in the analysis, we are considering emotion. I think that it is by coming to terms with our emotions that we reduce their effect on us. Paradoxically, Valuation-Informed Indexers are LESS emotional than Buy-and-Holders because they acknowledge that emotions matter. Buy-andHolders are MORE emotional because on some level of consciousness they suspect that emotions matter and it scares them to death that they are ignoring this factor in all their analyses. No Mr. Bennett, I merely pointed out what returns for an investor would have been had they invested in either of the two Vanguard mutual funds I mentioned or in a basket of index funds in the case of the Coffeehouse Portfolio over the 15-year period you boast about. Those particular mutual funds and the Coffeehouse Portfolio were readily available to any investor at the time and required no special knowledge to purchase or utilize as an investment strategy. I can appreciate Rob’s comments, to a point. As a Certified Financial Planner who has been helping folks find, define and achieve their aims, goals and objectives, I continue to learn new ways to help people every day. What I learn from my experiences dealing with thousands of people cannot be learned in books — practical and academic learning are vastly different. It’s important, when looking for a professional to work with, that you feel comfortable with the individual and you are confident of his or her experience, certification and you can identify with this individual as one who you feel a long-term, values based relationship can be established. I could not emphasize more the value of “expertise” and “practical experience” when helping people. Buy and hold? For the most part, a long obsolete theory that, unless you are talking about fixed income instruments help for a long term goal, just does not work in this economic environment. While I am not an advocate of trading and short term decisions, laying out a long term plan, reviewing it regularly and making changes when necessary due to life issues, market conditions etc. is the way to move in a forward motion. Always remember: between A and B, there are a million points to be addressed: we call that life. Welcome to the new world!